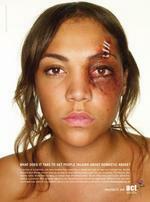 We've seen plenty of domestic violence ads, but this campaign actually makes us cringe. For Women's Aid, agency Grey London paints bruises onto celebrity faces and plasters them far and wide, hoping people would look, recognize, gasp in horror and decide to get comfortable with talking about their own secret bruises. Granted there are some conversations that started out taboo and are now part of the public tell-all, like routine plastic surgery. But domestic violence is a deeply personal, humiliating affair, almost always entangled in feelings of love, loyalty and fear of stigma. We doubt any one series of visually traumatizing campaigns will help start a casual discourse about it in a public space. And in the States, you actually do need to have a bruise before you can even report anything. Kind of defeats the purpose, right? AdPunch has more images if you want to take a look. Domestic violence should be a public outrage and can happen to any woman regardless of race, gender, social class or background. Prime Minister Tony Blair said that he was happy to support the campaign, by Women's Aid. He added that the Government had made a "substantial investment" in fighting domestic violence. 25 specialist courts existed, he claimed, and this number would be expanded to 60. Lets hope it's the perpetrators that cringe in knowing this fact.